If you suffer with stress, burnout or chronic fatigue, it's more important than ever to find a yoga practice that will aid your recover and not leave you feeling more depleted. Find relief from stress, burnout and chronic fatigue with these gentle, all-level classes that incorporate breath work and optional mantras. While designed initially for those with Chronic Fatigue Syndrome, this course is applicable to many chronic and ongoing symptomatic conditions and is gentle enough for all levels. In this series of gentle, all level classes, leading expert Fiona Agombar shares with you the practices and techniques that allowed her own recovery from these conditions, giving you the tools to support your own healing process. For those with health challenges exacerbated by stress or trauma, Fiona works to change the autonomic nervous system response back to a healthy pattern so that it no longer chronically hyper-arouses. 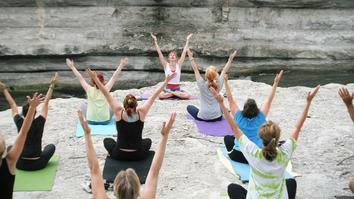 Fiona introduces us to her series ‘Yoga for Chronic Fatigue Syndrome’. 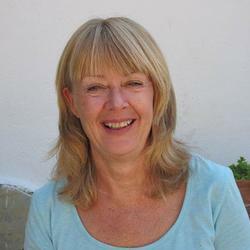 Fiona guides you through yoga breathing exercises whilst laying down (pranayama) and yoga nidra (yogic relaxation). With thanks to asquithlondon.com for clothes and buttaflyseat.com for props. Savasana is often referred to as the hardest posture. This gentle practice builds on the stillness of this classic reclining posture. With thanks to asquithlondon.com for clothes and buttaflyseat.com for props. After deeply relaxing the body during meditation, Fiona leads a chant for health and vitality. With thanks to asquithlondon.com for clothes and buttaflyseat.com for props. 05. I Am Healthy. I Am Full of Vitality. Gentle standing postures with optional chanting that will help you to centre and ground. With thanks to asquithlondon.com for clothes and buttaflyseat.com for props. Discover the range of motion in the spine using gentle movements, combined with (optional) chanting. With thanks to asquithlondon.com for clothes and buttaflyseat.com for props. Restorative, supported postures and gentle movements for tired, stressed bodies. With thanks to asquithlondon.com for clothes and buttaflyseat.com for props. Using a chair and props, Fiona shows you how to gently release the shoulders and hips, ending with a yoga nidra (deep relaxation). With thanks to asquithlondon.com for clothes and buttaflyseat.com for props. Yoga for CFS, Stress and Burnout is a 3.5 hour course, comprising of 7 different yoga sessions with Fiona Agombar. Join us as Fiona shares powerful practices, developed through working with hundreds of people with ME/CFS, to support your energy, healing and general well-being.